WhatsApp was down for 2 hours last night after an outage, which hampered its services. This happened sometime after 2 AM IST, and the issue raised concerns on Twitter, Reddit etc, where people confirmed that the outage was not limited to India, but a global one. There was no official statement from the Facebook owned instant messaging service, which only made things worse. According to Engadget, this was the statement they got from the service. "Earlier today, WhatsApp users in all parts of the world were unable to access WhatsApp for a few hours. We have now fixed the issue and apologize for the inconvenience." It is unclear what happened, but services were reportedly restored after 2 hours, as can be seen in the text message in the above screenshot, taken from my phone. 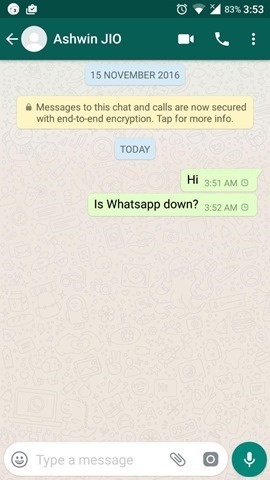 WhatsApp seriously needs to reconsider posting updates on social networks regarding such outages, to give people a clear idea of what is going on. But that is unlikely to happen, as is evidenced by its dormant Twitter accounts from 3 years ago.